Carly Rae Jepsen might've been the last muse for PornBurger's Mathew Ramsey, but now he's traded a pop princess for a queen. Specifically, he's drawn inspiration from the Mother of Dragons herself, Game of Thrones' Daenerys Targaryen. 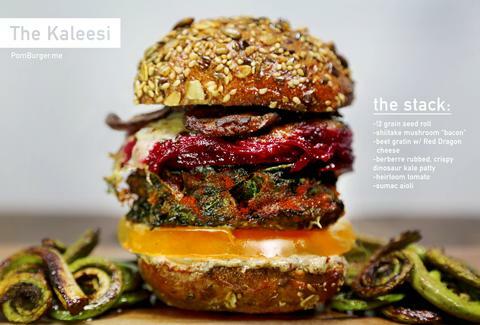 The site's newest Kaleesi Burger pays tribute to the Dothraki queen with a berberre-rubbed kale burger topped with shiitake "bacon", Red Dragon cheese, heirloom tomato, beet gratin, and sumac aioli. And while the burger does lack Dany's preferred staple of horse hearts, she'd probably be appeased. Kristin Hunt is a food/drink staff writer for Thrillist, and thinks we should name all the foods after Olenna Tyrell. Follow her at @kristin_hunt.